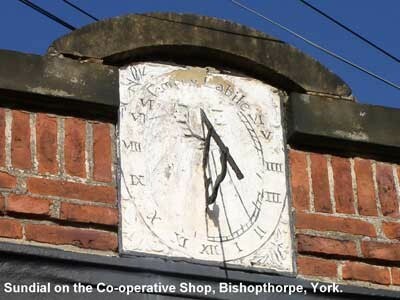 The old sundial on the front of the Co-op store has been a minor pleasure in the village for many decades. Unfortunately, time and weather has taken its toll on the familiar stone face and the Latin inscription, Tempus Labile, has become almost illegible. It seemed a great pity that this landmark should be left to deteriorate so that it might, eventually, come to be looked upon as an eyesore and removed altogether. The Bishopthorpe Local History Group decided to take action. The Group first contacted the British Sundial Society(www.sundialsoc.org.uk) and was given the name of Harriet James, an experienced sundial restorer who specialises in stone dials (www.sunnydials.co.uk). Photographs both old and new were quickly emailed to Harriet, along with the dial’s history. She soon gave her opinion that it was certainly worth restoring. Contact with United Co-operatives was, at first, a little slow but, eventually and much to our delight, the managing director agreed to fund the restoration. On the 17th November 2005, Harriet came to Bishopthorpe to view the sundial at close quarters and to meet representatives from the Co-op. Surprisingly, the decision had already been taken to allow Harriet to restore the sundial and it was removed from the building there and then. She left the village with the dial for her workshop in Wiltshire, where she has started work on the restoration. The earliest photograph showing the sundial and ‘date’ slab taken c1900. 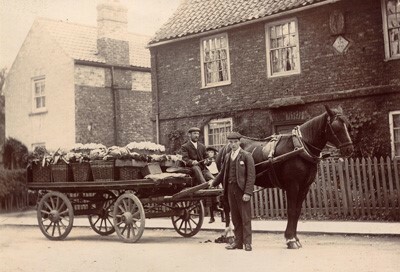 This photograph, which shows Bishopthorpe market gardener Mr. Forth in front of Sundial Terrace, is one of the earliest that we have which shows the sundial. It was taken about 1900, but the age of the dial is harder to ascertain. From the style of the decorations and numerals, it could date from the late 17th century. In 1898, Bishopthorpe vicar, Canon J. R. Keble showed an interest in the sundial when he wrote in the Parish Magazine that it was “one of the picturesque features in the village”. The Latin motto inscribed on its face: Tempus Labile, he translated as, “Time is fleeting”. The parishioners were asked if they had further information, but the response was, unfortunately, negative. Canon Keble also remarked on the stone or marble slab which can be seen in the photograph positioned beneath the sundial. The slab bore the date, ‘1691’ and the initials ‘T. P. M.’, which he thought referred to parishioners Thomas and Mary Pindar who owned the property at that time. … an old, nicely-carved stone dial which is fixed against the front of a cottage house in Bishopthorpe, near York; and below is a small, apparently marble slab, let into the wall, with the date 1691. They have possibly no connection with each other, and may be relics of some former archiepiscopal buildings. Over 100 years later, sundial restorer Harriet James shares the view that the dial and slab were not connected and that the dial was not designed for this building. There are two reasons for this: First, the dial can be seen sitting high up under the eaves of the cottage which would have caused serious overshadowing making its use as a teller of time obsolete. Secondly, the dial is laid out to face due south, and yet the property it was fixed to faced slightly east of south. Sundial Terrace following refurbishment c1908. 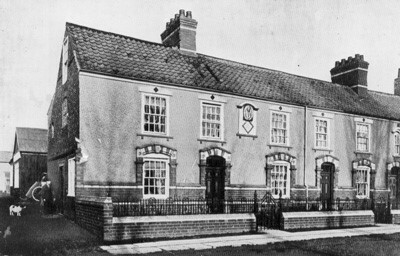 In 1908, the York branch of the Co-op, then known as the York Equitable Industrial Society, was expanding the number of stores in the area and decided to ‘set up shop’ in Bishopthorpe. They purchased the last two cottages in Sundial Terrace with a view to demolishing them at a later date and, when the money became available, replace them with a purpose-built shop. In the meantime, the cottages were refurbished and continued to be let. The sundial and the ‘1691’ slab were carefully preserved and seem to have been made more of a feature, as seen in the photograph above. A temporary store, which became branch No. 19, was put up on the land behind the first cottage. This can just be seen on the left of the photograph. Made from wood and corrugated iron the structure could easily be erected and dismantled in sections by the staff. The store was familiarly known as the ‘Tin Tabernacle’ and first used in 1901 in South Bank. Whenever a permanent store was built, it was moved on. Several other new York suburbs saw the ‘tabernacle’ before it arrived in Bishopthorpe in 1908. It is not known exactly when the Co-op demolished the two cottages in Sundial Terrace and built the new shop, but it is likely to have been during the 1930s as it appears on the revised 1938 Ordnance Survey map of Bishopthorpe. Once again, the Co-op decided to keep the sundial and fixed it to the centre of the building. Unfortunately, the ‘1691’ slab was not retained and it has disappeared. The sundial, however, remained in position, gradually falling into a sad state of disrepair until November 2005 – and the rest, as they say, is history! George Briggs, Jubilee History of the York Equitable Industrial Society Limited (Manchester, 1909), p217. Mrs Alfred Gatty, The Book of Sun-Dials (London, 1st edition, 1872), p110. C. Rickards, Zoe Thomson of Bishopthorpe (London, 1916), p164. Bishopthorpe Parish Magazine, September 1898. With thanks to Harriet James for further information.